Master Stop™ is the answer when you’re looking for custom anti-slip tapes and treads unique to your application. 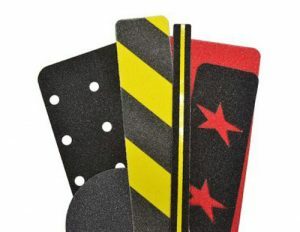 Prevent slips and falls in any workplace environment, while including custom touches such as color, a company logo, a special die-cut shape, or any number of other custom options. Don’t settle for non-slip tape treads that compromise the aesthetics of your flooring. Our selection of mineral abrasive anti-slip grit surface offers the traction you need, with a pressure sensitive adhesive that can be applied in both interior and exterior applications. Learn more about our die-cut anti-slip tapes or custom non-slip tape treads when you’re looking for safety flooring that comes in a variety of different colors. Have dark locations where you need safe footing? 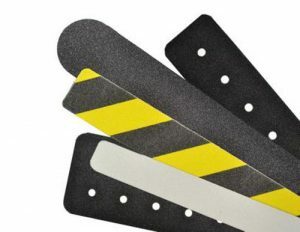 Our glow traction tape is ideal for helping employees easily spot the tape from their peripheral vision. As a leader in safety, Sure-Foot Industries specializes in making slip-resistant flooring that offers an ideal way to minimize expenses while making your business environment safer for employees and customers. Our friendly staff is committed to supplying anti-slip tape to meet any specifications. Contact us today and speak with a representative about using our slip-resistant tapes in your facility safety, renovation or new construction project. Looking for information on bulk anti-slip tape rolls? Visit our Bulk Rolls page for information on our bulk roll program. At Sure-Foot Industries we understand that every location is unique and that each application requires a perfect fit. Therefore, we offer fully customizable anti-slip fiber glass solutions. From custom step covers to intricate flat panel pieces we can accommodate your specific needs. Our CNC Router enables us to offer consistent precision parts made to your exact specifications. Please feel free to contact us so we can better understand your exact requirements. Our commercial non-slip fiberglass products are made with a proprietary blend of mineral abrasive epoxy grit that provides superior slip resistance. These panels and covers provide a durable permanent anti-slip solution. They are lightweight, easy to apply and perfect for just about any structurally sound surface. Slipping and falling is the most common cause of accidents in the workplace. Decks, ramps, scaffolding, mezzanines and wet floors are all much more hazardous than many people realize, and sometimes vigilance on an unsound surface isn’t enough to avoid a serious injury. These slips and falls can happen to anybody at any time, which is why Sure-Foot offers a full range of custom-made grit-coated fiberglass products. These non-slip coverings provide a permanent and durable anti-slip solution to businesses, workshops, construction sites, and other places where slippery surfaces exist. While it is always important to exercise caution to avoid slipping and falling, our grit-coated walkway covers will provide an extra level of protection without damaging your surfaces or being too obtrusive.